The best reason to see Angelina Jolie’s more-than-decent film adaptation of Laura Hillenbrand’s Unbroken — the story of Louis Zamperini’s grueling odyssey adrift on a lifeboat in the South Pacific and in several Japanese prisoner-of-war camps — is to experience torture from the side of the tortured, to feel vicariously what it’s like when an enemy has absolute power over your life and death. (Needless to say, I don’t mean to imply a connection between this and the House of Representatives’ recent “torture report,” which is obviously a partisan effort to make a few bad apples stand for the CIA under the rigorously ethical Bush-Cheney administration. Perish the thought.) 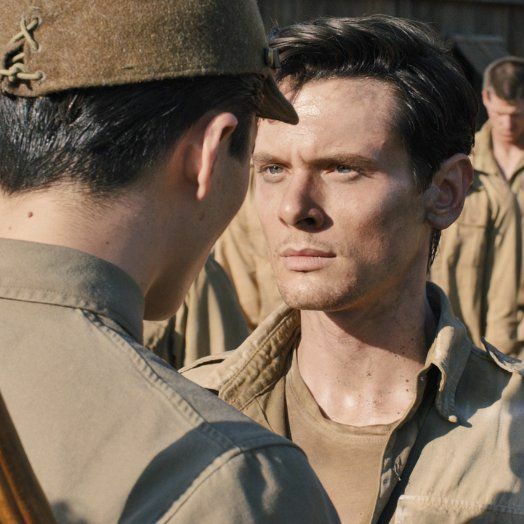 At its essence, Unbroken is a tribute to manly perseverance, its message so nice, it’s stated twice: “If you can take it, you can make it.” Taking the film is no walk in the park, either. The young British actor Jack O’Connell is Zamperini, whom we meet aiming bombs while his plane-mates do battle with a swarm of Japanese Zeroes. Things are soon dire — which is Jolie’s cue throughout the film to move in on Louis’s face as he recalls symbolic moments in his life. Among them: being bullied by kids who call him a “Dago.” His episodes of juvenile delinquency. His beginnings as a runner under the training of his older brother, who gives him the “if you can take it, you can make it” maxim. His trip to the Berlin Olympics in 1932. But the bulk of Unbroken is present tense with a vengeance. Zamperini spends more than 40 ghastly days on a life raft with two other airmen (played by Domhnall Gleason and Finn Wittrock), and his “rescue” leads somewhere arguably worse: to a prison-camp commander known as “the Bird” whose mission in life becomes to take the American Olympian and break him. From the time Zamperini’s plane hits the water, the movie is one blow after another after another after another a hundred times more. Possibly I’m undercounting. The soldiers are so skeletal that it’s difficult to look at them, and, in one late scene, the Bird forces scores of American and English prisoners to line up and punch Zamperini in the face. Unbelievably, it gets even worse after that. Jolie is actually restrained compared to Hillenbrand, who — as she proved in her unusually graphic Seabiscuit and even more so in Unbroken — is a glutton for her subjects’ punishment. But the film is still relentlessly one thing, its message (aside from “If you can take it, you can make it”) a mixture of Rocky Balboa and Christ: To remain standing when your persecutor has devastated you physically and emotionally is the best revenge, and you should forgive rather than retaliate in kind. Speaking personally, I couldn’t agree more. But the movie’s more powerful takeaway is that girly men with daddy issues should not hold positions of power. As the Bird, Jolie has cast the Japanese glam-rocker known as Miyavi (real name: Takamasa Ishihara) and directed him to bat his lashes and gaze on Zamperini with a mixture of rage and longing. A British officer fills out the Bird’s biography — wealthy childhood, militaristic family, deemed unfit for combat — before adding, “None of this explains his erratic behavior.” No, his erratic behavior reads like Sexual Perversity in Tokyo. The homoeroticism is, as they say, “a choice,” but it’s possible that it throws Unbroken out of whack. There is plenty whack left, of course, though much of it feels secondhand. Jolie’s last film, In the Land of Blood and Honey, had more evident passion (it centered on a sadomasochistic relationship between a Serbian officer and Bosnian woman); this one often feels like rewarmed Spielberg. The opening shot of American planes drifting out of a sunrise is gorgeous but obviously computer-generated, and many of the images are self-consciously iconic. The script — credited to the tag team of William Nicholson, Richard LaGravenese, and Joel and Ethan Coen — is a little on the nose for my taste, short on the kind of stray narrative curlicues that give movies some extra texture. And does Jolie get all she can out of O’Connell, who was riveting in this year’s prison drama Starred Up? You’ll largely remember him here for his cheekbones and ability to take a punch. Still, Jolie gets the dirty/ennobling job done. If the narrative is finally unsatisfying, it’s because the last vital chapter — the way in which Zamperini was able to have a life after years of unspeakable cruelty and the dashing of his Olympic hopes — is signaled in a couple of title cards before the closing credits. Unbroken proves that Zamperini could take it and make it — but make what of it?